In Part One we looked at a thought experiment designed to make it easier to understand a basic principle – that inner surfaces of systems can have higher temperatures and therefore higher values of radiation than the outside of a system. The only reason for creating that experiment in its unreal environment was to make the basic physics and the corresponding maths easier to follow. In this case the outer wall radiates 30,000 W out into space and so the system is in equilibrium. Yet the inner wall is radiating 1,824,900 W.
You can see the maths in Part One. From a few comments on this blog, and some comments I saw elsewhere, clearly many people still have problems with it. That’s a good thing. It’s good because it means that the simple problem is doing its job. It is simple enough that almost everyone realizes the calculated temperatures are correct. It is simple enough that the maths can be followed. But it exposes an idea that many can’t accept – total radiation from a surface inside the system is much higher than the energy source. Your point might be driven home more emphatically by noting that the inner surface absorbs only 23.8 W/m2 from the super-light-bulb, yet in the 3m-thick example it emits the afore-mentioned 1452 W/m2 (and also absorbs 1452 W/m2 of wall-emitted radiation). The inner surface is also in energy balance. We can consider the values as total energy per second (W), or as energy per second per unit area, (W/m2). We will stay with the total energy because these are the values we have already been working with. No energy is created or destroyed in the system encompassed by the inner surface. From some comments related to this and other articles, explaining how equilibrium is reached might help. Once again, the 1st law of thermodynamics is used to calculate the dynamic situation. If there is net energy added to an element of the system then its temperature increases. The inner wall receives 30,000 W. It radiates an amount dependent on temperature but also receives that same amount from the inner wall surface (therefore the net heat received is always = 30,000 W). The outer wall radiates according to its temperature. Spherical symmetry makes the calculation much easier than if it was a box. If the first law of thermodynamics meant that no inner surface could radiate at a higher value than the outer surface of the system then everything would be at the same temperature. In the PVC hollow sphere example the inner wall would have to be at 133K – the same as the outer wall. 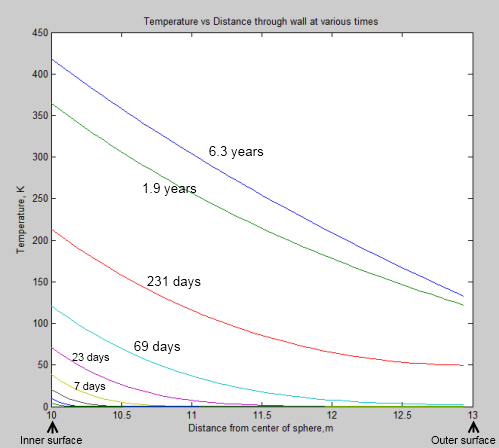 This would mean that no heat could flow from the inner wall to the outer wall – or that Fourier’s law was wrong. And lagging hot water pipes was also “a big con”. We all know that is not the case – well, maybe not everyone has heard of Fourier, but everyone knows about insulation. The reason why so many people think that Trenberth and Kiehl’s diagram is flawed is because of an incorrect understanding of the first law of thermodynamics. If Trenberth and Kiehl’s diagram violates the first law of thermodynamics then so does my PVC sphere. There’s just the small matter of trying to explain how the inner surface would stay at 133K. Analogies prove nothing. But for those brave enough to consider that they might be wrong, I hope the PVC hollow sphere provides some illumination. Update: Do Trenberth and Kiehl understand the First Law of Thermodynamics? Part Three – The Creation of Energy? Please address the practical question of does adding CO2 to the air result in increasing the ground temperature? I claim that The KT diagram says no. Apparently you claim it can. Please then address where the added CO2 gets the energy to cause the added GHE? I claim we are at long term equilibrium E-in = E out=235 in KT, in which there is a limited energy input and an excess of GHGs in the air and ocean. At this point if I add another GHG. It will just sit in the air, because at equilibrium, all of the photons required for the GHE are already in use creating the existing 33C of GHE warming for an energy in of 235. Unless I add a photon or increase the 235in I can NOT get more GHE which WOULD result in warming at the ground when it adjusts to the new equilibrium. According to the KT diagram and since the 235 or solar insolation has not significantly changed since the 1960s (source realclimate.org) then there has been no change in the ground temperature. Obviously this is false, since we have measured global warming from 1970 to 1998 or2005. The KT diagram is thus incomplete. The only way in the current diagram to get warming is to create it, thus violating the first law of thermodynamics. Simply adding CO2 without adding an energy photon to cause the GHE can NOT cause warming. The amount of energy in, not the amounts of GHG dictates the temperature. Unfortunately the climate m.odels do not include gravity variations as an energy source. The climate models are therefore also incomplete. See http://www.scribd.com/doc/27343303/Gravity-Causes-Climate-Change for the evidence that temperature changes correlate to changes in gravity. adding co2, will decrease optical depth in the LW spectrum… so it will increase the time it takes for a given photon to exit the system… so it will increase the number of photons bouncing around the system… which is an increase of energy contained in the system. So short answer, yup it could. You really do need to understand this is NOT new energy. At equilibrium energy in will equal energy out… SOD has two excellent threads on the Venusian atmosphere, which will be relevant, in helping you understand this. The amount of energy contained in a system is dependent on its properties, as well as energy input. Mike I appreciate the time taken to respond. BUT you just created energy if there are more photons of the same energy running round the system. Tain’t possible unless you get the energy from somewhere. I can understand breaking a uranium atom to release the binding energy, which will cause warming- – thats what Nuclear power plants do. Now you want me to believe that simply adding a chemical molecule without adding a photon to create the GHE process will result in increasing the energy content or number of photons? Excuse me, but where did the extra photon energy come from? So when the Earth moves water vapor from one place to another when the humidity doubles from 50% to 100% and it rains- why doesn’t this local addition of GHGs result in doubling the GHE warming due to the higher density of GHGs? Could it be that there are insufficient photons available because they are all already in use creating the existing 33C of GHE warming & you can’t create any more GHE warming without adding more photons. I appreciate the response but it does NOT make sense. A conceptual way to look at it is that if you add a gas that absorbs IR, the constant energy the earth receives from the sun stays in the climate system longer before it exits the system via radiation into space. So more energy is being added by the sun. There will be more total energy in the system, even after equilibrium is reached. This of course doesn’t take into account positive & negative feedbacks in the real complex climate system such as albedo increases or decreases, etc. ; topics for different posts. 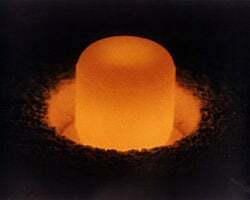 Here is a link to a picture of a Pu 238 ceramic pellet that glows when insulation is placed around it. When the pellet is removed from the insulation, it stops glowing, at least to the naked eye. Think of the earth as the pellet, except instead of Pu 238, the energy is provided by the sun’s energy being absorbed by the earth’s surface. I think SODs thought experiment, shows the concept except better because its backed up by math. Sometimes seemingly logical concepts can be misleading or outright wrong. I think you are both saying the same thing & it is very helpful in visualizing. It is basically the same premise as the delay in releasing a photon by the GHG is what causes a higher residence time for the photon & hence the cause of the GHE warming itself. Now a question: physically where is the delay? As Mike pointed out adding the extra GHG increases the optical density which would increase the delay if density has anything to do with it. Does it? Since the delay in a GHG is caused by absorption & release by the GHG AND if there are no available extra photons to be absorbed (they are all already in use at equilibrium) then we can not get an additional delay due to absorption.(?) SO does optical density impact the actual time of transport via those hundreds? thousands? of absorptions? The majority process as I understand it is: photon at the speed of light, absorption & delay, energy return by collison (95% of the time), radiation of next photon at speed of light absorption & delay, collisions, next radiation etc etc. Where does the optical density come into it. and is such a delay of significant enough length to matter. Obviously higher density of GHGs means a photon has a better chance of hitting one, hence shorter distance travelled by photon & longer distance/time required to escape. BUT the duration of the shorter distance travel is trivial compared to the multi-nanosecond absorption delay isn’t it? If due to the shorter distance we get an extra absorption is it enough to matter? eg How many absorptions are required to get out? does one extra add 1% of time for a hundred, or .1 percent for 1 in a 1000 absorptions?? Next question (I am serions!) Do I really care? (from a global warming perspective) BAck in my original question I identified that gravity and potential energy are ignored both in the KT diagram and by the climate models & IPCC. The forces of gravity and eccentricity are 1000s of time larger than the energy from GHE absorptions AND hence dominate global warming on the 1 to 1000s+ year timescale. My paper identifies that these variations correlate to the 60 year global warming cycles (…1880-1940-1998…) & can cause the current warming 12 years after the previous peak due to Jupiter and Venus being at their closest points to Earth since 1998 due to eccentricity coincidences timewise. The gravity cause (as opposed to the GHE cause) ALSO explains why it can cool in 1999-2003 and also from 1940 to 70 and from 1880-1910 etc etc. SO my question becomes is the extra added delay due to added optical density from CO2 significant for global warming?- Intuitive answer NO, because the gravity caused cooling 1940-70, or all the other variable cooling years from 1970-1998 etc dominate the steadily increasing CO2/Keeling curves. (obviously it is for a physisist studying the problem, but do I care from the global warming perspective?) AND then the follow on question is the GHE warming significant compared to the gravitational variation warming? even tho by adding gravitational warming I also add more photons which actually increases the GHE warming over that from the solar insolation, since solar insolation (including solar based GHE) only accounts for 15-20C warming in the morning every day where as gravity/Potential Energy warming can go all the way up to the 289-20, or 289-33(from GHE)= 255K or so? In my humble opinion (as an engineer not a physicist) I feel that the GHE cause of warming variations is an insignificant dead end. Its real but it doesn’t matter. It is fun speculating. Thanks for the responses. Can SOD’s hollow PVC sphere analogy be stretched to fit planetary atmospheres? Possibly. The temperature gradient needed to drive conduction through 3 m of insulator can be replaced by the temperature gradient produced by buoyancy-driven convection, a lapse rate of 5-10 degK/km (depending on the heat capacity of the atmosphere and local gravity). Unlike SOD’s insulating hollow sphere, atmospheres radiate energy inward and outward at all locations. However, in optically thick atmosphere (like Venus and somewhat like the lower troposphere of Earth), the sum of upward convection plus net upward radiation is controlled by the lapse rate. This allows one to conceptually replace the PVC shell – with a 290 degK temperature difference between inside and outside – with an atmospheric shell – with a temperature difference 500 degK on Venus (ca. 70 km of lapse rate) or 50-100 degK on Earth troposphere (10-15 km of lapse rate in the troposphere). In this analogy, inward radiation from the hollow sphere translates to downward longwave radiation. I’m curious. Suppose you built your sphere and found the inside hot, and the outside emitting 30kW at 133 K, but you found a layer inside the PVC that was at 100 K – 33 K colder than the outside. The heat has a way to bypass the layer, so that part’s fine, but the question arises, what’s keeping that layer so cold? Wouldn’t you find this an oddity that you felt you needed to explain? I would be shocked! Shocked i say! There is a thread here on stratospheric cooling in relation to co2 levels… and after reading it many times, and scratching my head, i finally “got it”. But it also covers stratospheric “heating”, UV interaction with O2, O3 creation etc, there is a really good paper in there in one o SOD’s comments, that i found helped a lot. Nice question; IS this the same: The Earth temperature basically decreases from the center out, everywhere except in the ocean where the temp at a mile down is colder that the warmer temp a mile down in a mine or at the surface. The difference is due to density and conductivity differences. Ocean is less dense than land hence more energy flows thru the land pathway than thru the water pathway accounting for (some/all?) the differences. I was hoping to wait for a more appropriate thread so my question would be more relevant. I just want to make sure my understanding of equipartion as it applies to the atmosphere is ok.
A co2 molecule absorbs a 15um photon and becomes vibrationally excited. Within picosends that vibrational energy is distributed amongst the neighbouring molecules in the ensuing collisions, raising the average translational energy of the molecules; the gas is hotter than it was before as defined by the Ideal Gas Laws, or real world measurement (?). Before I ‘understood’ the concept of equipartition I’d ask myself, aren’t the collisions just as likely to excite a vibrational state in the co2 molecule as extinguish it? Obviously this isn’t the case because if you pump IR into a mixed gas containing GHG’s it gets warmer in a sense that you can actually measure with a thermometer. If collisions were equally likely to excite a vibrational mode there would be no net heating, correct? I also understand that at tropospheric temperatures and pressures the collisional energies are not usually sufficient to meet the threshold required to excite the vibrational modes, this is the reason for the apparently asymmetry or one way flow from radiation > vibrational > translational. Of course then the ‘whole’ gas radiates (not much?) based on its new temperature. Presumabley, because the vibrational state is quantised, it can’t be partially extinguished or partially excited in a molecular collision? It’s an all or nothing affair, correct. Can/has this been directly observed? Which is to say, can we observe a gas and see the billiard-ball’ molecules undergoing collisions and gaining huge wads of momentum not present in the original translational energies? I get that the process is inferred quite directly when you pump IR into a gas with GHG molecules and it heats up, I am just curious if you can directly observe this aspect of equipartition? Speaking of momentum, I’ve read Nassif Nahle’s stuff about stimulated emission and conservation of the aborbed photon’s momentum. I picked up that it’s more relevant for lasers but even so, I wonder’ surely, the momemtum of the absorbed photon isn’t obliterated during thermalisation, some ‘memory’ of that must be retained through the myriad collisions? Is that significant, or just an interesting artefact? So basically, how’s my grasp of equipartition as it effects the real world, and to a lesser extent, what about the convservation of the absorbed photon’s momentum? Apologies for the god-awful grammar in places, was a bit hasty banging that one out. Working through your post, I was occasionally confused by transfer of power, power per unit area, and temperature needed to radiate a certain power per unit area (partly because the central power source wasn’t assigned a size and therefore a power per unit area or temperature). I imagined it is infinitesimally small. I didn’t mention that because I didn’t think it was important, but perhaps it is important if it’s not infinitesimally small. I’m not really sure about your calculations in the case when it’s larger and absorbs and emits radiation. You will have to calculate the “view factor” of a small sphere inside a larger sphere. It does complicate the calculations in many ways. Suppose we go with infinitesimally small – does it all make sense? Wouldn’t an infinitesimally small source approach infinite temperature? I think it would be less confusing to stick with a small reasonably sized bulb. It might complicate the calculations. But it will prevent any hidden errors leading to an erroneous interpretation. The size of the source should be irrelevant as long as it is uniform (radiates equally to all directions) and in the center. A giraffe shaped energy source sitting on the inner surface somewhere might give somewhat different results. The temperature of the source is not important either. You can have very different temperature objects radiating at the same power output (change emissitivity). Power per unit area can be found using distance (radius) from the point source. SOD said (8/6 8:05) that if the source has a physical size, one “will have to calculate the “view factor” of a small sphere inside a larger sphere”. I briefly considered this problem and settled for the approximation that the radiation would be absorbed by the source and the inner walls in direct proportion to their surface areas. Since the source is roughly half as far away as the inner walls of the sphere that receive the most direct radiation, the numbers in my post might underestimate the amount of radiation absorbed the the source by roughly a factor of two (at least for sources much smaller than the inner sphere). Mait (8/6 15:26) suggested that the size of the source is irrelevant. The temperature of the inner surface (432) is determined by the temperature gradient required to conduct 30,000 W through the insulating PVC shell, but the fate of radiation from that hot surface depends on the size of the source. For example, if one imagines a source that is 9.9 m in radius, essentially all of the radiation leaving the walls of the inner sphere will hit the central source, where 80% will be absorbed. Here on earth, we have this situation – a large power source (the surface of the earth heated by the sun) that is touching the PVC insulation (the atmosphere), but the atmosphere radiates both up and down and convects rather than conducts. Let’s stay with the PVC sphere. Everyone can understand it. Guess what happens if I add more PVC? The inner wall gets hotter. Where does the PVC get the energy from? The atmosphere is a heat reservoir in the same way that a lake is a water reservoir. If a lake maintains a constant level (ie temperature), then the amount of water (heat) flowing in must be the same as the amount of water (heat) flowing out. Knowing the amount of water flowing in and out tells you absolutely nothing about the amount of water in the lake. Adding CO2 to the atmosphere is like dredging the lake to increase its volume – dredging the lake increases its water capacity, so that it will, after a time, contain a larger amount of water without any increase in the amount of water flowing in. I’m pretty sure that CO2 doesn’t increase the atmosphere’s “heat capacity” in the technical sense, but the above is my mental model for how it works. Question though: Does the ‘CO2’ raise the level of the lake (ie. temperature) or increase its depth (ie. heat capacity while temperature remains the same)? Well, the primary effect would be to increase the heat capacity, but the incoming energy would soon increase the temperature to a new equilibrium. Add carbon black to the fluid in your radiator. Your engine will run cooler, guaranteed. I disagree sort of with Chris. The water /lake analogy is nice for visuallizing but fails when you apply the physics. You equated adding water to adding temperature. In the CO2 case you can add CO2 & it will just sit there without adding temperature (unless it absorbs a photon to generate the GHE warming.) But if there are no more photons because they are all already in use, then you just get excess CO2 capacity. The same as when the number of photons coming in decreases at night, this dictates a mew colder equilibrium, AND you are left with leftover uused CO2 in the air because there are fewer photons available.. If more CO2 equated to more temperature then the temp could NOT go down at night. Same as if you increase the humidity in the air (ie increase the GHG Water vapor) the temperature does NOT increase because there are no excess photons available to absorbed by the added water vapor. John, so, is a power cable with the same amount of electricity passed through it, as an element, be at the same T as the element? This seems to be what you are saying. Or is it more relevant as to the resistance of a material, to the passing of energy, that sets the amount of energy it will contain at equilibrium… Steel is three times as dense as aluminum, aluminum is three times more conductive than steel… and you believe they will reach the same T with the same flow of energy applied? I think you really have to approach this with a bit more of an open mind, energy flow into the system is one factor as to determining its equilibrium temperatures, but how much energy the system contains matters! I think you are confusing conductive flow of heat with energy input. I agree Mike they will NOT reach the SAME temp profile Since they have the different capacity etc they will each come to their own equilibrium temp gradient for a given fixed 1366 W/m^2 or 30KW input & density . BUT to radiate 30KW the to space they will have to be at 133 @ 13m. BUT unless you increase the amount of energy coming in, they will always revert to their own equilibrium which is dictated by the energy in..- Simple application of the SBL OR the heat transfer equ, will result in more heat going out at the higher temp so it will revert to the original equilibrium, NOT to a new higher one. They can’t warm if you do not add energy, or unless you significantly change the density of the material and a few ppm of CO2 doesn’t do it. The air volume and density can also change. The PVC can’t hence the model fails. If you then add more mass (ie more CO2) which is trivial compared to the total atmosphere, then the GHE can NOT increase, even if the mass increases in the air AND also decreases in the ground. It is the number of photons that dictates the GHE & temp, not the number of CO2s. It is the increase in the sunlight in the morning that increases the temp. If At any given instance the energy in does not change (ie our average since the 60s), then if the mass of CO2 changes, ie increased density then the energy per mass of CO2 MUST decrease- ie it would get colder , not hotter. BUT when you add CO2 you also lose O2, (eg CH4+2O2(from air)=CO2 (to air)+ 2H20- which rains out, so the total air density will get slightly less which WILL result in a slightly warmer temp (Which I would guess would be trivial compared to the increase you would get if you added another photon. I understand SoDs temp change if he doubles the mass and goes to 15m, That is not reality. What I am saying is that his model does not model the Earth. PVC can’t expand and contract like the air. His model can’t change the temp inside 10m since it is a hollow vacuum. The Earth is not like that. He has to model a solid iron core, a liquid iron outer core a mantle and ground and water etc- ALL of which can change if you change the density if one or the orther. His model & the KT diagram insist that the only thing in this world is a PVC shell from 10-13m. This is not true. WHen you add photons in the morning the air heats up AND the water and ground inside 10m heat up. His model & the KT diagram do not allow this. In order to get any GHE based warming they have to violate the 1st law, OR the temp change is due to density changes which would also happen if you added more O2 instead of CO2. What this says to me is that the GHE does NOT increase just by adding CO2 hence there is a flaw in the model that says the optical density increases & hence there is more GHE warming. I am saying that the density (of water vapor) increases and decreases all the time AND it does NOT change the GHE temperature so we also should be able to increase the amount of CO2 without increasing the GHE induced temperature.- ie number of photons absorbed dictates, NOT the number of GHGs. A generic comment on SoD’s model. The model says it is hollow inside. The Earth is not hollow. The model fails. Just like the KT diagram fails because it does not consider the interior of the Earth. It only considers the space from the ground to the TOA. If you add CO2 or density to the air, then the temp will supposedly readjust all the way to the center or the Earth (but not the model sphere) The hotter Earth would then radiate or conduct more heat outward. AND it would readjust to the ORIGINAL equilibrium IN=OUT. If by adding CO2 you adjust the temp you ALSO adjust the density and probably the volume (location of TOA at 13m, ) You can only ADD energy if you ADD photons. Adding CO2 just adds to capacity not to actual temp- What this says (Mike & John at the top) is that the idea that the real increase in optical density does NOT result in more GHE absorptions and more temperature. I do NOT know the actual physics of it, BUT given that the air normally has an excess of GHGs over what is in use for the GHE then apparently adding a few more can be done without adding to the temperature. ie The rule of “more GHG means more temp” is not valid. The real rule is “More photon absorptions means more temp” and this is dictated by the amount of energy coming in, NOT by the amount of GHG available. The model says it is hollow inside. The Earth is not hollow. The model fails. Just like the KT diagram fails because it does not consider the interior of the Earth. It only considers the space from the ground to the TOA.. The earth is not made out of PVC either. In fact, why did I even produce the model? But I expect that most people see that the PVC hollow sphere model is correct – and that inner surface temperatures must be higher than outer surface temperatures. I’m sure that everyone can join the dots together for what that means for “1st law violations” – or not – of energy balance diagrams of the earth’s surface. SoD. There is no dispute that the inner temp will be higher than the outer temp. Just look at the Earth core. The question is can an increase in CO2 change the equilibrium. I claim NO. unless you are talking about a minor change in density. Increasing the CO2 does NOT increase the GHE absorbtion of photons, because there are only a limited number of photons available. If you claim the temperature due to GHE increases when you add CO2, then why doesn’t the temp increase when the humidity increases? (My answer, because the number of photons is limited, and there are always excess GHGs in the air. You have to get over this fixation that CO2 changes everything. SInce the solar insolation basically hasn’t changed since the 60s then the KT diagram says that there can NOT be increased GHE warming since the sixties. BUT this is obviously not true. We have warmed from 1970-1998. What other sources are there to account for this? YOur analysis says that increased CO2 density accounts for it.- but it fails to account for the fact that increased CO2 means that there MUST be equivalent decreased density in the land or water. My analysis says the force of gravity from Jupiter getting closer & further away changes the temp every ~12years, 60 yrs, 900+yrs etc due to eccentricity, Hence we get 1998, & 2010 temp peaks etc etc. How can More CO2 account for the colder years in between? Both your model & the KT diagram are incomplete. Without adding more energy (gravity causes friction heat causes higher ground temp which radiates more photons & hence more GHE also) your model lacks sufficient energy to account for the observed warming. PS. The term “heat capacity” shouldn’t be used in the lake analogy. As far as I know it generally refers to how much much energy is needed to change the temperature by a unit. The heat capacity changes very little with the CO2 changes in question and the heat capacity doesn’t make much difference in the radiative part of heat transfer. In my terminology we have an EXCESS (over what is required for the GHE) of GHGs. Adding more just adds more excess, not more warming. If this is true, then the basic Arrhenius premise (repeated by the models & IPCC) is not valid. More GHGs/CO2 does NOT result in more warming. The photons (or energy in, if you prefer that terminology) is what dictates the limited amount of GHE warming. Same question again- What limits the GHE? Why doesn’t adding more GHG Water vapor to the air result in more temperature GHE increases? After all 50% humidity results in some 85%+/- of the 32C. SHouldn’t 100% humidity result in ~twice as much temperature increase? If you can, pick up a book on thermodynamics/heat transfer. Visit a university library nearby. -heat transfer by conduction has an equation. -heat transfer by convection has an equation. -heat transfer by radiation has an equation. But none of these equations includes a term for photons. Would you like me to post a few pages from a thermodynamics textbook so you can check? So are you now denying the existence of photons? I do not deny the approximate validity of the equations. Yes the temp inside the PVC will be warmer than at r-13m. Open your eyes to other possibilities than CO2 causing everything. Open your eyes to the idea that the force of gravity which pushes the Earth into eccentric orbits of hundreds of thousands of miles just might result in some warming, while the “sole” source of solar insolation which doesn’t even move the Earth is considered the ultimate heat source in these models. Open your eyes to the idea that a pendulum and other mechanisms can transfer energy from gravity (potential energy) to E/M kinetic energy (heat). Open your eyes to the idea that Arrhenius might have been wrong in his formulation of the GHE. Look at the wiki definition of the GHE under “Svante Arrhenius”. It says that ΔF = α ln(C/C0), where del F is temp change and C is GHG concntration in the air. The damn equation doesn’t work if there is any unused GHG in the air. which happens every night. as the number of photons or energy (since you do not believe in photons) decreases. To correct the equation you define C as the number of GHGs IN USE by the GHE. with the excess (ie water in the ocean, excess humidity in the air) being unused. This makes his interpretation that “more GHGs means more warming” (AR4, WG1, Ch1 p.116) just plain wrong. Which makes the warming models wrong, which makes the IPCC report wrong. which means you have to look for another source of energy or pohotons to cause the real 1970-1998 warming. Sorry SoD, you have no scientific credibility with me. First let me say, this has quickly become one of my favorite sites. It has definitely answered a lot of questions that I’ve had over the years relating to this issue in understandable, scientific terms. Personally, I believe that Science Of Doom should write an article about the John Dodds paper he included in his first post in this thread. I don’t think that there is as much to explore there as with the imaginary second law, but there are some good bits. Just to get that conversation started, let me ask a few questions about the “Gravity Causes Climate Change” paper. 1) Let’s say that we have two bodies, each of mass M separated by distance D. Considering no other forces, and no feedback (unless you want to) what is the equation for the temperature increase of each body due to the presence of the other? Has this ever been measured? Can it be measured? Feel free to change the parameters of the question if that is necessary to get the temperature increase (i.e. the masses must be different, one must orbit the other, there must be at least three bodies, etc.). 2) You state in the paper and above that the IPCC report and others are wrong because they do not take this gravity induced warming into account. Has any other person, at any level of scientific publishing, taken this same view about the missed temperature increase due to planetary gravitation and orbits, including any and all skeptics of global warming theory? I did not find a bibliography with your paper, so I’m not sure if you are a true trailblazer or if you are refining the work of other scientists and applied it to this particular realm. 3) Is it possible to heat your house by putting heavy objects on high shelves? Why or why not? How about adding large compressed springs under the flooring? 4) Your paper states that “the forces of Gravity were identified with the Sun and Moon being by far the most significant. However, their variation is essentially unchanged on a year over year basis.” If this is true, why do tides occur daily? Is there warming due to the gravity of the Sun and Moon according to these same cycles? Do Jupiter, Venus, and Saturn have a significant effect on tides? Let me also try to answer a few of the questions you posed in your previous posts. I don’t think that was the intent. I think that sod is saying that you’re missing important factors about heat transfer by trying to reduce everything to just plain old generic “photons” and ignoring concepts like “wavelength”. Also, he is asking you to think scientifically/mathematically about the problem. Once you’re in that mode, it is much easier to discuss the viability of your ideas. Telling people to “open their minds” is fine, but makes you sound a little bit like a cult member. I think we’d both prefer some equations and testable experiments instead. OK, that wasn’t a question, but it allows me to also throw in, what is this mechanism in your paper that transfers energy from gravity of planets to heat? Perhaps this is subsumed by question one about the equation. There is also another consideration. Why would mother nature not use the existing excess of GHG water vapor, and instead make the GHE WAIT until man adds more CO2 to get more positive WV feedback to get more WV? This gets back to wavelength; sod has an 8 part series entitled, CO2 – An Insignificant Trace Gas?. It has lots and lots of detail, especially what different gases in the atmosphere can absorb various wavelengths. If there are wavelengths that CO2 can absorb readily and H2O can’t, does that make this question easier to answer? Open your eyes to the idea that the force of gravity which pushes the Earth into eccentric orbits of hundreds of thousands of miles just might result in some warming, while the “sole” source of solar insolation which doesn’t even move the Earth is considered the ultimate heat source in these models. How far does the sunlight reaching the earth push it? How much of the temperature of the surface of the earth is due to that sunlight? Is there perhaps a problem with this analogy? 1. Yes Sun Earth & Jupiter system. Equation is Newtons force of gravity converted to temperature. 2. Yes There is a paper that identifies that the climate of an eccentric moon of jupiter is volcanic due to the variable forces of gravity from Jupiter and some of the other moons. Nasa recognizes temperature from the force of gravity why doesn’t Nasa/GISS, the originators of one of the climate models? 3. No you can’t heat your house by putting objects up high. You have to use energy (with friction etc losses) to put the objects up high. There is a net loss of energy in the entire process. Closest you can practically come is probably a grandfather clock, where you wind the spring once a week & it maintains a pendulum to keep the time. Re the belief in photons comment- Yes I know SoD really believes in photons. He’s too good a scientist not to. But his insistence on using heat rransfer to prove a point just begged for an impertinent answer. No. The collisional lifetime of the excited vibrational state (15 micrometer) is somewhere between 1 and 10 microseconds, not picoseconds. It couldn’t be picoseconds anyway as the mean time between collisions at 1 bar is about 1 nanosecond. Only a fraction of these collisions, however, involve a change in the vibrational state, thus the microsecond range lifetime. At 296 K, only 4% of CO2 molecules are in the excited state, so it isn’t equally likely that a collision will excite or de-excite a given molecule. Pumping IR into a mixed gas will only warm it if the source temperature is higher than the gas temperature. If the source temperature is the same as the gas temperature, absorption and emission will be equal and there will be no change in total energy of the gas. One can calculate the effective source temperature from the inverse of the Planck equation if you know the flux density and frequency (wavelength) of the source. In the absence of any source of energy, a volume of gas in a transparent container will cool by radiation. I’ve read Nassif Nahle’s stuff about stimulated emission and conservation of the aborbed photon’s momentum. Nasif is not a trustworthy source for anything, IMO. There is no need to invoke stimulated emission in the atmosphere. The argument that spontaneous emission can’t occur because the spontaneous half life is much longer than the collisional half life is wrong. Look at radioactive decay. The half-life of 238U is 4.5E9 years, but you only need 81 micrograms of 238U to see a decay rate of 1/second. Avogadro’s number is very large, 6.022E23 per mole. 1.about how many absorptions will take place as a photon or piece of energy travels from ground to TOA or space? Are we talking 100s or 1000s? Regardless the total travel time is under a second & probably under a millisecond, which is the delay that causes the very real GHE warming. If so then adding more man made CO2 will only add to the excess, and NOT add to the number that have absorbed a photon at any given time. Therefore the Arrhenius paper is incorrect when stating that more GHGs means more warming. The change in GHE temperature is NOT proportional to the concentration of CO2 in the air as Arrhenius said, rather it is proportional to the number of CO2s actually excited, or the number of photons absorbed at any one time. If this is true then the IPCC methodology of assigning more warming to more CO2 is not correct. I don’t know the answer to your first question and right now I’m not interested in finding out how to determine it. For question number 2, your statement is incorrect. The excited molecules are not in an excited state because they absorbed a photon. 99.99% of them, or thereabouts, are in an excited state because of a collision with another molecule. Similarly, 99,99% of excited molecules don’t emit a photon, but collide with another molecule and the vibrational energy is converted to kinetic energy. Near the surface, more photons are absorbed closer to the surface by the wing lines that aren’t saturated and the wing lines then emit more photons toward the surface and DLR increases. At the top of the atmosphere, fewer photons are emitted because the effective height of emission of the wing lines moves to higher and colder altitude and OLR decreases by about the same amount DLR increases. The net result, all other things being equal (which they never are) is that more CO2 means a higher surface temperature. If I continue your sequence ending with “… that more CO2 means a higher surface temperature.” doesn’t the higher ground temp then emit by radiation – SBL-Stefan-Boltzmann Law(or transfer by conduction) a higher amount of energy/photons back up which then reverts back to the original equilibrium conditions which is dictated by the amount of energy /photons in, which must equal out total radiation by definition of equilibrium? If so then the energy out is also constant (at equilib) an no amount of CO2 manipulation can change that. (at equilibrium) It CAN change it during the transient (which is what you are doing) , just like the weather does (hi pressure means warmer temps, BUT there is an equivalennt low pressure somewhere that is colder.) The total averaged inside the TOA is constant for a constant input. I do not understand how you can get higher total temperature at equilibrium, if you have not added any energy? Adding more absorbtions by more CO2 without more input photons is a transient that will revert to the cooler equilibrium at the speed of light or the SBL. For things to balance, the surface has to have a net energy in from sunlight of 103.149 W/m2. With incoming sunlight unchanged, the surface sees 363.621 but only radiates 360.472 so it must warm (ignoring any change in sensible and latent heat transfer). This doesn’t exactly work out because MODTRAN doesn’t change the temperature profile in the stratosphere to reflect the increased cooling from the change in CO2, but it isn’t transient. The change in the equilibrium temperature is permanent. The system energy content can change without a new source of energy because more energy is retained. It’s no different in principle from putting another blanket on the bed or insulating a hot water pipe. If you lower the rate of heat transfer at constant energy flow, the temperature goes up. As far as humidity, the important number for the greenhouse effect is the specific humidity and total column precipitable water, not the relative humidity at the surface. The relative humidity can go from 50 to 100% without changing the total amount of water in the atmosphere. DeWitt, thanks for the example it has opened my eyes. Now I know that MODTRAN is also wrong AND I can explain why. The flaw is that you are defining an incomplete system. KT & SOD’s sphere and MODTRAN all define the “system” as the atmosphere from ground to TOA. They ignore the underground (ie most of the Earth). and they ignore gravity effects on temperature. Use the add a blanket analogy: If you & your partner are sleeping in a double bed, and you add a blanket to get warmer, then you are taking that blanket from your partners side & they get colder. If your “system” is defined as your half of the bed you get warmer by adding a blanket. If your system is defined as the whole bed there is a net no change in the temperature, just a redistribution of the temp profiles. Now consider that if you have a central air heating system that adds energy (gravity) then you can warm up without an added blanket AND without changing the body heatsource (solar insolation) in your “system”. Sorry I stand by my contention that the KT diagram, SoD’s model and now MODTRAN all have excluded pieces of the entire system. Since the system is supposed to be isolated or self contained with constant inputs and outputs at equilibrium they all violate the Conservation of Energy by adding CO2 without balancing it and acounting for the alternate sources of energy. To identify the error in SoDs equations- He is missing the source term for (variable) gravity caused energy, AND the losses outside the system (ie heat transfer from underground.) The equations are incomplete. PS: This has major implications for the world. 1. The IPCC models and climate models are also incomplete. More CO2 does not means more total Earth warming. 2. There is a lot of science, software and research and textbooks etc that is also incomplete in addition to MODTRAN. 4. Gravity warming as summarized in the “Gravity causes Climate Change” paper, and the full 150+pg “John Dodds Wobble Theory of Global Warming” at http://www.scribd.com, both indicate that variable gravity as a source of warming and cooling is much much larger than CO2, and it correlates to the Earth temperature changes over time. (including ice ages). It also explains sources of energy for El Nino and La Nina & why they shift north and south due to the variation in Jupiter etc orbits above and below the ecliptic sun-Earth plane. This opens up a significant area of research that will replace the CO2 causes warming and IPCC reports. Since Mr Newton identified how to predict gravity it also makes Earth temperatures and variations predictable thus allowing hurricane and drought prediction AND that the Earth will continue to warm and cool for the next 25000 or so years as we approach closer to the sun in our long term eccentric orbit. According to GISP2 ice cores we are still 1-2 degrees C below Roman times temperatures. BUT we can’t control it, just adapt to it. If anyone else has any questions on these points from John Dodds – i.e., thinks they might be valid – please ask and I will try to answer them. SoD, do you have any response? You ARE a pretty good intuitive scientist. Are you at least thinking about it? Or does your silence indicate you can’t yet refute it. IF the chosen “system” (ie the air- ground to TOA) is defined without the ability to add unidentified external sources of energy (primarily gravity and PE in my case but also cosmic rays, or the trivial energy from breaking apart the nuclear forces in uranium (power plants) and the (smaller than E/M solar insolation) chemical forces in burning hydrocarbons etc .) then what the models do is arbitrarily assign ALL unassigned observable global warming to the only variable left- ie CO2 & the GHE and so called positive feedbacks. Positive feedbacks by definition actually create energy also in violation of the Law of Conservation of Energy. (unless you can identify & count where the energy comes from- electronic feedback systems have an unlimited source of energy coming from the plug in the wall.) This means that any estimates of the GHE total value from these artificially constrained model systems are actually false and over estimated because of the model constraints. The GISS model assigns all gravity induced warming to the GHE because of the “system” constraints. (you might also notice that we have addressed 3 of the 4 known to man forces and energy sources- by adding gravity I’m addressing the 4th). Mathematically the models would be internally consistent, like your equations for heat transfer, or like the GISS model E which I think is a major accomplishment- even if wrong. When fixed to address variable gravity it is a major workable tool. & my guess is that the GHE energy from adding 280ppm of CO2 is trivial compared to gravity & so can be ignored in the Model E.
The change in density and total mass of the atmosphere or the planet below the surface from mining and burning fossil fuels is trivial. The density of the atmosphere does change with temperature and MODTRAN, as implemented on the web, does not take this into account. The temperature profile changes with a change in the surface temperature offset (but only for the first 10 km), but the pressure profile doesn’t. But this is a second order effect and does not affect the general conclusion that increasing the CO2 level will increase the system (defined as the planet plus atmosphere) energy content at steady state at the same incoming energy flux from the sun. You can’t extract free energy from a gravitational field (see the Second Law and perpetual motion machines of the second kind) so I don’t find your comments about the effect of gravity to be either relevant or convincing. With that moon john, which you where saying was volcanic due gravity, its really gravity slowing the moons orbit, converting the inertia to thermal heat through friction through the crust/planet… literally running a tide that lift mountains in passing. Obviously, we can easily see how much crustal uplift our moon has on us…not a lot. And the rate of rotation, kinda comes unstuck with a look at Venus. Length o day may have an effect on solar effects, and gravity may effect the position of the earth in relation to the sun, but for it to generate heat, it must be converting our planets inertia, through crustal friction, this should be easily observable! As DeWitt has said, gravity in it self does not create energy, once something has fallen, it takes as much energy to lift it as can be gained from the falling. P.S. did i have a discussion with you sometime ago about turbines over at WUWT? I seem to recall very similiar reasoning, in regards something else. 1) Your experiment with 2 closed concentric spheres has nothing to do with the “backradiation” of IR radiation by greenhouse gases, in the open atmosphere. Yours is just a demo of conduction according to Newton-Fourier law (dQ = kt S/th dT), which is not the mechanism by wich the Earth’s open atmosphere is working (convection + radiation). But you can choose a sphere with walls in copper, or silver, iron, etc., and you will see that different materials have different conductive properties, and they reach different temperatures, sometimes very high. And so? 2) Backradiation, according to the false theory from IPCC, means that gases of the atmosphere (colder than soils) would be able to RAISE temperatures of the hotter surface of Earth, but that’s impossible, colder body cannot raise the temperature of hotter bodies, without external work. 3) You made confusion between the concept of temperatures and the 2nd law thermodynamics. If your 30,000 W power heater is keeping to heat the closed hollow sphere, then PVC temperature is raising, and then PVC (or copper, or silver) walls become very hot, and then they start to send heat to (now) colder body (smaller heating sphere). So your experiment does not prove at all that colder bodies heat hotter ones, because in conduction from heaters in closed space, heated bodies can sometimes become hotter than heaters, and then they start to heat the heater. But that is a confirmation of 2nd law! 4) What you wrote, that a 30,000 W power heater source can put into the system even 1,800,000 W of energy is incorrect and misleading, but above all has nothing to do with backradiation and conservation of energy (1st thermodynamics). First of all 1,800,000 from inside walls in PVC are not Watts, Watt is the power of the source of heat, and it remains 30,000 W = max power (work capability) of that source. Energy is Watts/second = Joule = total work/energy put into the system in 1 second/hour/day/year, etc. Thus, you can put into the system even 18 billions Joules, letting the source heating for hours, or days in a closed system. But that has nothing to do with “backradiation”, no physical body at all in the Universe can add a single Joule more than those received, without an external source putting more work into the system. So, sorry but your experiment is just a waste of time, and it doesn’t prove anything. A while ago I would have asked the same question. So that is why I created this simple problem – to demonstrate the one and only point that temperature inside a body can be higher than the temperature outside a body, and this is calculated by using the first law of thermodynamics. If temperature is higher radiation will also be higher and this also doesn’t violate the first law of thermodynamics. Do gases radiate? Do you think they don’t?? Or do you think the radiation only goes one way? Or that the radiation, when it reaches the surface of the earth, vanishes? Or is reflected? Many people also espouse your theory but none have a coherent theory for where this radiation goes, and the many supporters you might find for the “headline idea” have contradictory claims. I have a few articles on this subject, most grouped under the heading The Second Law of Thermodynamics in the page: Confusion over the Basics – Science Roads Less Traveled. The Three Body Problem – and feel free to point out the problems in that article. Amazing Things we Find in Textbooks – The Real Second Law of Thermodynamics – and bring your own textbook along if you like and quote from that. The Amazing Case of “Back Radiation” -Part One and the subsequent two parts.. Image 27 steel cubes, 1 meter on eash side. These cubes are floating in outer space, in a vacuum, far from anything else. They are arranged into a bigger cube with three 3×3 layers, looking like a big Rubik’s cube, but with a 50 cm gap between each cube so that no cube is touching any other cube. There is no convection or conduction between cubes, just radiation. Now, imagine that they all start at a completely uniform temperature of 1000K each, and we observe the temperature of each face of each cube over time. My intuition (and I feel this will be shared by many people) is that the cube in the middle will cool at a slower rate than any of the outer cubes. If anyone disagrees, I’d be interested to know. If you agree that the centre cube cools down slower than the other cubes (but you also believe that back-radiation can’t warm the earth’s surface), please explain what mechanism causes the centre cube to cool down slower than the others. Finally, imagine that we repeat the experiment using only the centre cube, getting rid of the other 26 ‘outer’ cubes. Will the cube now cool down faster than it did before? If so, is it reasonable to say that, in the first experiment, the outer cubes were ‘warming’ the centre cube?